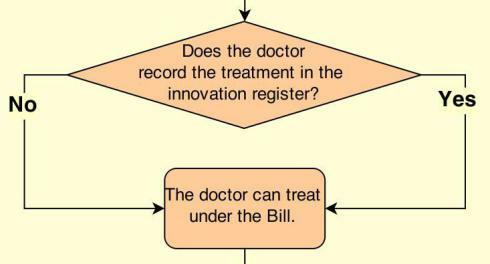 Okay, my post earlier today about how the Medical Innovation Bill would really work (as opposed to how the bill team claims it would work seems to have generated quite a bit of discussion, so I thought it would be worth running through my flowchart quickly with you to show my working out, as it were. Here are links to the bill team’s charts once more, with their boundless confidence about how the bill would be used. How will the Medical Innovation Bill work? Anyway, the bill team have been very clear this is what they intend. If a doctor chooses to innovate, it is for that innovating doctor to decide whether to rely on the protection of the Bill and therefore to take the steps set out under the Bill. I’ve observed before that it seems unfair for the treatments that have the greatest risk for patients to have the least protections for those patients, but there you go. These points all go together, and the reason why these are true can be found in the bill text itself. Or rather, not found in the text, as the problem here is that the bill fails to define any limits to the circumstances in which it can be used. Various amendments were put forward in the House of Lords in an attempt to rein in the scope of the bill, to define diseases for which it would or wouldn’t be appropriate, to define the circumstances under which it could be used, to limit it just to cases where no effective treatment exists, even to define what “innovative” means. All were rejected, so the bill still applies to whatever an individual doctor decides is an “innovative” treatment for any condition under any circumstances. AS I’ve pointed out before, the bill removes the ability for the treatment decision itself to be questioned later. Therefore, a treatment with no logical basis, or even one which has already been disproven, could theoretically be undertaken under the protection of the bill. The bill deliberately attempts to remove any mechanism for oversight of the treatment decision itself, replacing it with an oversight of whether the steps I’m outlining here were followed when deciding to treat. Again, there’s nothing in the bill to demand the doctor consult the register. The doctor can consult the register, or not, it’s up to them. Consent. Patient consent has been held up as being a protection under the bill. But the flow chart makes clear that it is no protection at all. 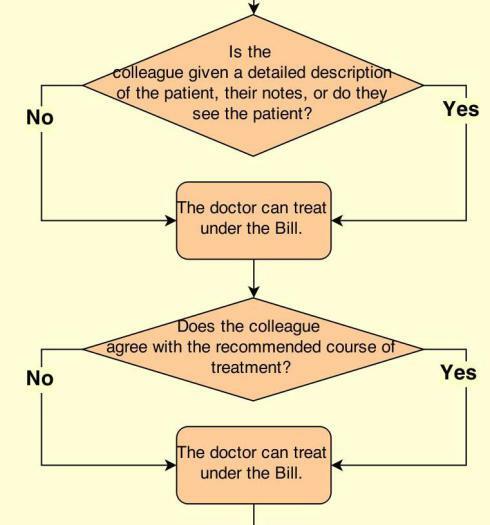 If the patient must consent in order for the doctor to be able to have the protection of the bill, then the doctor must demand consent before they can treat the patient. Effectively, they would be in a position of saying, to a potentially desperate, vulnerable patient, “I have this treatment I think may save your life, but you have to sign this piece of paper before I can treat you,” It’s no barrier at all to exploitation. It is also arguable that it’s not possible for patients to give informed consent when the doctor themselves may not know what the outcome of the treatment is likely to be. However, to require another doctor formally to support the treatment, whether in writing or verbally, would expose the second doctor to the risk of additional litigation. In the Government’s view that is problematic. If that countersigning doctor were sued, they would not be able to rely on the Bill directly and we would not be able to give them any certainty about their legal position. As such, doctors may be reluctant to give their agreement, which may reduce the likelihood that doctors will choose to innovate under the Bill. Instead, the Bill requires the doctor to take full account of the views of at least one appropriately qualified doctor in a way in which any responsible doctor would be expected to act. That means that a doctor will not be able to ignore those views or give them only minimal weight—such as only to note them—unless there are reasonable grounds for doing so. I’ve written about this here, but in essence fear of litigation against whoever is consulted about the proposed treatment means that their agreement cannot be made a formal requirement. It’s also clear that there may be “reasonable grounds” to ignore the advice of colleagues. Who decides whether the grounds are reasonable? The innovating doctor herself. The Saatchi Bill team have made a big song and dance about a late amendment which supposedly requires doctors to record their treatments, and the results of them in a central register, so that others could see what had been done. Apparently, Lord Saatchi has been calling for this for two years although – given this is his own bill and he has made numerous amendments of his own to it – one wonders why it took a last-minute charge from his noble colleagues to achieve it. Nigel Poole QC has eviscerated this amendment. In brief, the bill requires a doctor to comply with any professional requirements that may exist to record the treatment, but no such professional requirements actually exist, and the only organisation that could create such a requirement – the GMC – weren’t told about this, don’t think it’s appropriate, and don’t think they could enforce it even if it were made a requirement. So if a doctor follows all the steps laid out in the bill, then there’s no come-back if anything goes wrong. No questioning, no review of the treatment, no redress for a patient harmed by the treatment, no stopping the doctor doing it all over again with the next patient. There you go. Follow the bill, receive a Get Out of Jail Free card.